Welcome to Craftsman Extra Board! 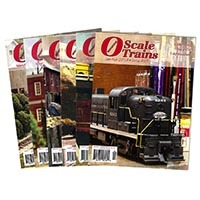 This section is updated periodically with short features contributed by our readers, as well as some recent favorites straight from the pages of Railroad Model Craftsman. Check back as we continue to add new articles! Readily available at most hardware and farm supply stores. 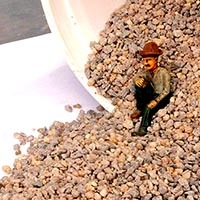 poultry grit can find many uses for model railroad scenery in all scales. 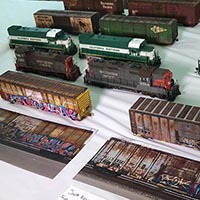 Our associate editor attended the 15th Annual San Francisco Bay Area Prototype Modelers Meet on Saturday, June 16, in Richmond, Calif., featuring hundreds of scale model exhibits from local modelers. 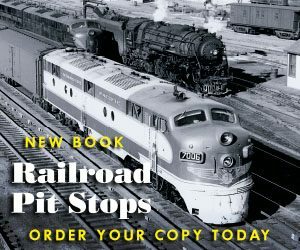 The Iowa Interstate took over operation of the old Rock Island main line between Council Bluffs, Iowa, and Bureau, Ill., in 1984. 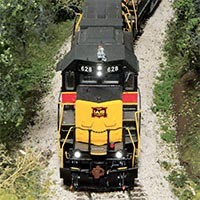 Joe Atkinson models the railroad in May 2005, reflecting a time he spent on the prototype line railfanning and documenting its operations. In this installment, we’re going to focus on the key rail-served structures in this scene. 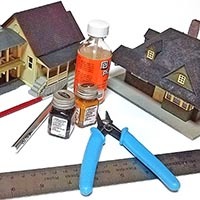 When we began this series, we tried to select building kits that would be readily available and easy to customize. 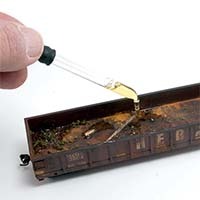 If you model a railroad that operates in wet weather region, adding trapped rainwater to the cargo area of the car can be a detail that takes your empty gondola to a new level. I have always wanted a real caboose in my yard, but have never been able to afford one. One night while sitting at my work bench I thought why not model a caboose in the front of the farm house on my layout? And so began the project. 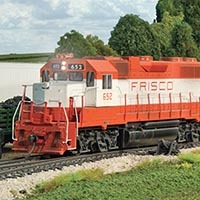 Like most modelers, I am often asked why I chose the Frisco. The biggest reason is that it’s a great trip back to a simpler time and place. No matter where my family went in Springfield, there was the Frisco, so I associate those great family times with the railroad. Jon Percy had considered modeling a fictional shortline based on my hometown. After receiving a tour of the compact and efficient facilities at Butler Yard, he decided to model the Buffalo & Pittsburgh Railroad in N scale. 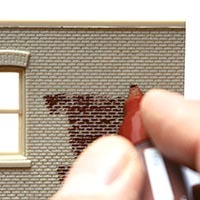 While the façade of the model building calls for the look of polished brick and neatly painted wood trim, the common bricks of the sides and back need special attention. 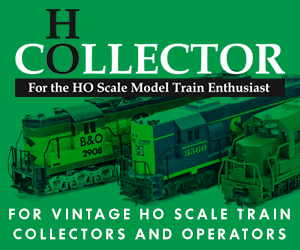 Here a modeler can draw upon boyhood memories of taking shortcuts down dingy alleys to get to the rail yard and its various late nineteenth-century and early twentieth-century brick buildings.